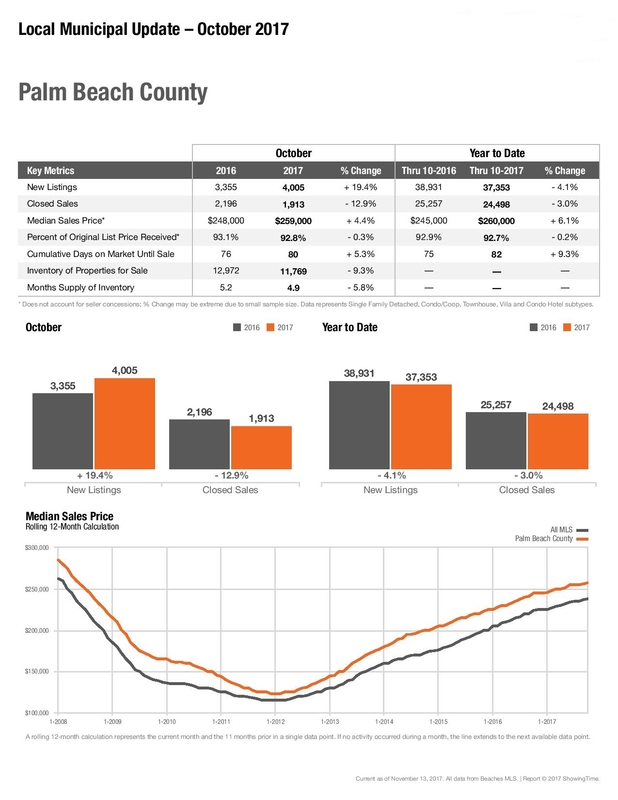 The latest real estate statistics are out for October 2017 for Palm Beach County. The numbers tell a story and Irma had an impact on the Palm Beach Real Estate market too. Is it a buyer or seller's market? It depends upon the area and the price of the home. The odds are that if you have a home over $600,000 you are likely in a buyer's market. What changed in October 2017 in the real estate market? The luxury market has seen 2 new listings to every closed home for several months. In October the number of new listings increased to almost 4 new homes for every luxury home sold. Many buyers were unable to purchase homes in September so we will be watching the November numbers to see if the market changes are more than the Irma impact. What price ranges are still hot seller's markets? Are there still hot areas? The $300,000-399,999 price range is one of the hotest price ranges. However it is not so hot that over pricing is ok. When a property is overpriced it doesn not sell. There are opportunities in every market. So what is the best opportunity right now? The move up buyer is the lucky one. If you are selling in a lower price range you could likely be selling in a seller's market and buying in a buyer's market. That is a win-win. New listing are up 23% year over year and up substantially from September to October. Why? It could be due to a market change or it could be because sellers couldn't list due to Hurricane Irma in September. The number of pendings are down 8% year over year. Again this could be impacted by Irma. Next month we will see if the changes are more than that. The median sale price remained the same from September to October. Closed sales in October were down 3.8% year over year. How does the real estate changes impact the value of your home? Let us see how we can help.